Certificates of course completion and letters from BIA certifying accreditation. There are a lot of cases like theses, and we have seen them at DACA clinics and they have come into the Day Labor Center looking for support. And up until now, we’ve only been able to refer them to trustworthy attorneys (of which there are but a handful, unfortunately) or to non-profit organizations with offices in distant cities. But this all changes beginning this month, now that the Pomona Economic Opportunity Center, better known as the Day Labor Center, has received accreditation before the Board of Immigration Appeals! 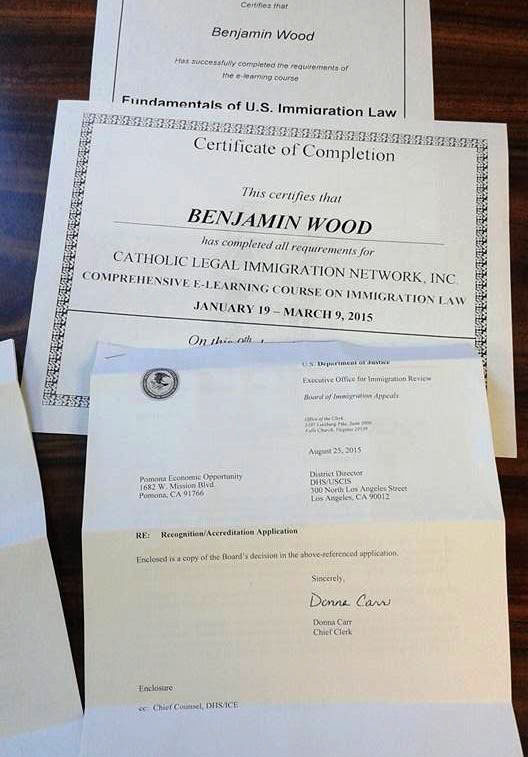 Which is to say that our executive director Fernando Romero and our organizer Benjamin Wood are now certified to fill out forms and offer immigration-related legal advice. We are happy to be able to offer these services and to be able to provide an alternative to the high costs of the legal counsel of attorneys, and with the trust that many of our local notaries cannot offer. Legal consultations will be offered by appointment only. If you need an appointment, simply call the Center at 909-397-4215 during normal business hours and we will attend to you as soon as possible. 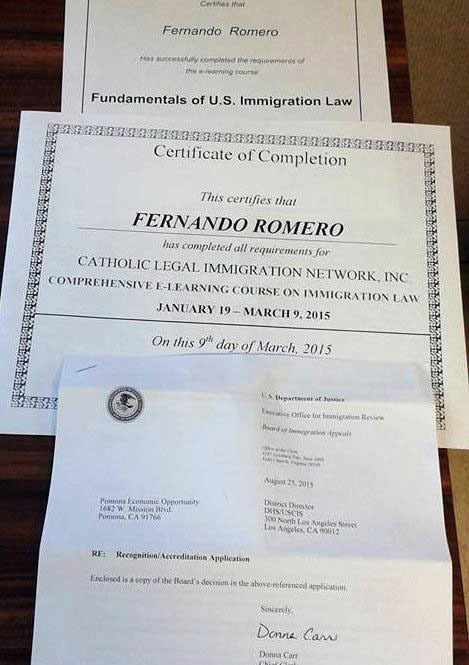 It is worth pointing out that this is something that we never could’ve cone without the support and advice of many of our friends within the migrant movement, such as Emilio Amaya and the rest of the staff of the San Bernardino Community Services Center, Russell Marco Jauregui, esq., Aurelio Ortiz, and Reyna González. Additionally, we must acknowledge that without the support of the Ready California Coalition, which facilitated our attendance of the class offered by CLINIC, we never would’ve gotten to this point.